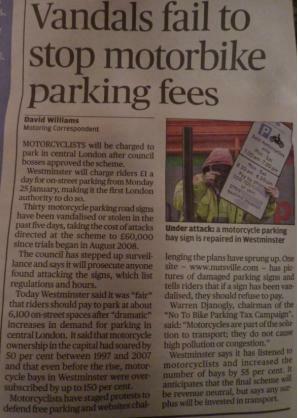 The Evening Standard have today published a rather short article (right) to report the decision made by Westminster’s Conservative Councillor Danny Chalkley to charge motorcyclists for parking on a permanent basis, from 25th January 2010. First of all, what the article fails to mention is that the said charge is actually a STEALTH TAX imposed on motorcyclists for absolutely no reason whatsoever, other than for filling up Westminster Council’s coffers, as if the wealthiest local authority in Europe was struggling to cope with its financial demands. In exchange for £1 a day or £100 per annum, bikers get absolutely no extra benefit compared with when motorcycle parking was free and prior to the introduction of the tax, on 4th August 2008. The parking bays have remained in exactly the same conditions as when their use was free of charge, so would Mr Chalkley please explain to us what bikers are paying for that they didn’t use to have before? Nothing is the right answer, but if you ask Chalkley, he will either ignore your question or come up with some non-sense spin. The charge is also a stealth tax because it doesn’t cost Westminster Council a single penny to maintain the motorcycle parking bays, as the council has clearly decided not to invest in them. A Freedom of Information request has revealed that not a single penny collected from the parking tax has actually been re-invested into motorcycle parking to directly benefit bikers, so again, what are they being charged for? Nothing is the right answer! * 3,000+ objections to the scheme received in February 2009 and again in July 2009. * Monthly demonstrations by thousands of bikers bringing the traffic in Central London to a complete standstill during rush hour, something that the Council has never seen before, unlike parking officer Fitsall’s allegations. * Hundreds of Freedom of Information requests submitted to Westminster Council in lieu of unanswered emails and letters from residents and commuters, thus considerably increasing the council’s workload and causing enormous and unnecessary stress to their staff. * The vast majority of motorcycle parking signs defaced (not just 30 as stated in the Evening Standard’s article) by a very large group of bikers who have decided to take radical action to make their voice heard (after having been totally ignored), in June 2009 and again in January 2010, thus making the parking tax unenforceable and obliging the council to stupidly spend thousands of pounds of taxpayers’ money to replace the signs until they get defaced all over again. This is instead of gritting icy pavements on which “little old ladies” could fall and who seem to be Councillor Angela Harvey’s primary concern these days. * Investigations into Westminster’s parking affairs being currently carried out by the European Commission for suspected breach of EU law with regards to the lack of tendering process in the setting up of the Verrus pay-by-phone parking system, leading to the running of the Partnerships in Parking (PiP) scheme, which is entirely driven by Westminster City Council (official case number: SG-CDC-2008A-7695). * Investigations into Westminster’s parking affairs currently carried out by the Office of Fair Trading, again for suspected breach of the law with regards to the pay-by-phone parking system (official case number: EPIC/ENQ/E/75795). * Public inquiry demanded by thousands of bikers on 7th December 2009 to the Department of Communities & Local Government (DCLG) into the way more than £600,000 of taxpayers’ money granted to Westminster City Council were used to set up the Partnerships in Parking (PiP) scheme, suspected to be illegal. And with the deep mess Councillor Chalkley, assisted by former Director of Parking Alastair Gilchrist, have put Westminster Council in, they still dare to say, according to the Evening Standard, that they have listened to motorcyclists! Had they genuinely listened to motorcyclists, as they suggest, Chalkley would have scrapped the bike parking tax. This is what thousands upon thousands of bikers have asked him to do, and guess what, he’s making it permanent and blaming his colleagues for doing so (“If it wasn’t for your public protests I could have quietly scrapped the M/C parking charges, but i am under pressure from my colleagues to make it permanent”, so he says – source: http://nutsville.com/?p=1532)! Anyway, the word “permanent” in this context is meaningless. Bikers will carry on fighting against Westminster Council until this unwanted parking tax is fully scrapped, no matter how long it may take. In the meantime, and while Westminster Council’s parking activities are being investigated, a large number of bikers keep defacing all the parking signs, thus making motorcycle parking free in Westminster, despite the council’s threats to prosecute them, should they be caught. We should soon find out who the real motorcycle parking criminals are… the fight is far from over! Excellent post, when it’s all laid out like that it shows just how completely mad this tax is. You think this is bad enough, but there’s something even more coming soon that will put the icing on the cake for bikers. Click on the article’s picture above and read the numerous negative comments made against this ridiculous motorcycle parking tax. There is not a single comment in favour of the tax. Nobody wants it, except Danny Chalkley and Alastair Gilchrist, because of their bloody ego! What a weak article the Evening Standard have written. Thanks for your good post above that exposes the truth behind this crazy tax. As you say, the fight is far from over! Westminster Council will seriously regret their decision. I can’t believe bureaucrats have been ignoring the public like this. This is “du jamais vu”. Carry on fighting guys, the whole French motorcyclist community is backing you up. Vote Chalkley out in May, simple! I think the UK Government must reply to the EU Commission by no later than 20th January 2010 on behalf of Westminster… 6 days to go… can’t wait to see the Government’s reply. Please post it as soon as it is available. When bikers say NO, they say NO and they firmly mean it. Let the battle commence against Westminster Council! What makes this Tax even worse is that WCC created the ‘demand’ for on street parking by giving us Penalty Charge Notices (PCNs) when we parked in the ‘traditional’ off street places like alleys etc, forcing us to park on the street & then charging us for that too!! Bikers will not take it, the tax will go, I am sure of it.